I am co-founder and Research Director of Eco4Cloud, a spin-off from CNR and University of Calabria. Eco4Cloud commercializes a software that significantly improves the efficiency of data centers and Cloud infrastructures, leading to energy savings from 30% to 60% and to comparable reductions in carbon emissions. The software derives from years of research in the areas of Cloud Computing, data center management, bio-inspired algorithms, swarm intelligence. A paper that presents the mathematical foundation of Eco4Cloud, and the results of real experiments, has been published by IEEE Transactions on Cloud Computing, and is available here. 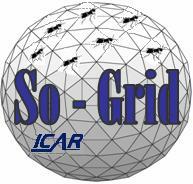 Within ICAR-CNR, I am involved in projects that aim to experiment and assess the use of nature-inspired algorithms and protocols for Grid and P2P networks. These algorithms follow the swarm intelligence paradigm: a number of entities perform simple operations at the local level, but these operations are combined at the global level so as to engender an advanced form of intelligence and achieve complex objectives. Self-Chord prototype available (source code available)! A. Forestiero, C. Mastroianni, M. Meo, Self-Chord: a Bio-Inspired Algorithm for Structured P2P Systems, 9th IEEE/ACM International Symposium on Cluster Computing and the Grid, CCGrid 2009, Shanghai, China, 18-21 May 2009. A. Forestiero, E. Leonardi, C. Mastroianni, M. Meo,	Self-Chord: a Bio-Inspired P2P Framework for Self-Organizing Distributed Systems, IEEE/ACM Transactions on Networking, April 2010. Published online. The prototype is available here! More information can be found on the following paper, downloadble from here. A. Forestiero, C. Mastroianni, "A Swarm Algorithm for a Self-Structured P2P Information System". IEEE Transactions on Evolutionary Computation, vol. 13, n. 4, pp. 681-694, August 2009.